I’m working on a publication history of Fowler’s Modern English Usage, along the lines of R.C. Alston’s Bibliography of the English Language from the Invention of Printing to 1800. For this, I need to have information on the publication of reprints of the book, for all three editions. reprinted June 1926, August 1926, October 1926, 1930 (with corrections), 1933, 1934, 1937 (with corrections). Hugely popular already in its first year of publication, in other words, and reprinted four times within the next decade, twice with corrections. 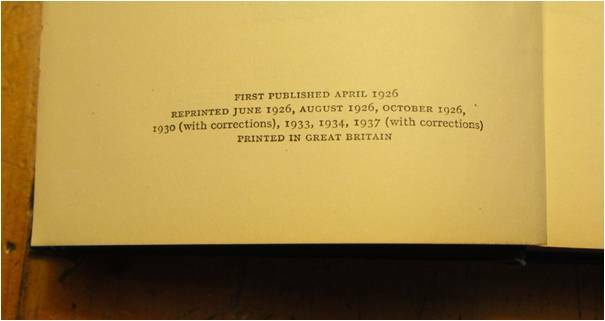 So my edition dates from 1937, and contains corrections to the first edition. My other copy of the book, which is not in very good shape, is a first edition. Please help me get more data like this: take your Fowler from its shelf, and let me have what information you find on the flyleaf. Jointly we can produce an overview of the book’s publication history, so it will be possible to assess its popularity. Thanks to S.W. Leefers for the following: “My copy from 1934 matches the reprints given above”: click on the links to view the images for the 1st edition, 2nd edition, 3rd edition. This entry was posted in usage guide and tagged fowler, OUP, publication history. Bookmark the permalink. just a thought. You can’t be sure it was “hugely popular” without knowing what the print runs were. 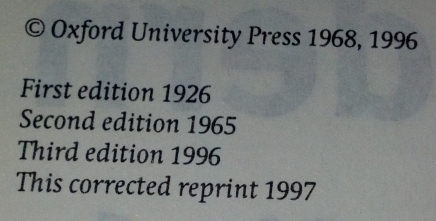 Reprints just indicate it was just more popular than the publisher expected it to be. For all I know, they might have been huge print runs, but without knowing, you can’t make that deduction. I expect someone at OUP could dig around in their archives and found out for you. Thanks for this, Katherine. You are right of course, but I was basing myself on Jenny McMorris’s biography for this. She writes on p. 178 that the sales of the book were “impressive”, and that 60,000 ccopies were sold before year ran out. It is a fascinating biography by the way. I read that the term ‘Fowler’ started to be used by people at the time to refer to condone correct use of the English language. I think that is a good indicator of popularity in itself.